Transform Your Life and Health by the Renewing of Your Mind! BREAKING NEW: Back to the Future! Your future has finally arrived. Yes, it is different than you thought it would be. Health care for the physical body is now the sole responsibility of each individual. Individuals are confident and feel safe in living the conscious self-healthcare or self-care model of healthcare for personal care of the human body. Join me and my guest as we begin the conversation on the current explosion in quantum health care. We are taking a look at the current view of bio-energetic and bio-information health care. 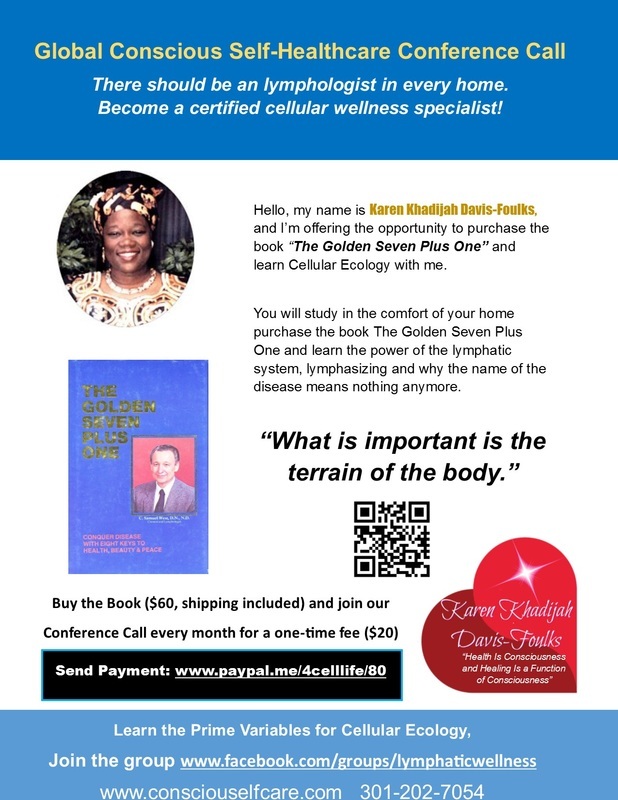 Mastering cellular ecology will assist each individual with maintaining a clean and healthy cellular environment. Sharing health care from the perspective of ‘Field Theory from Quantum Health and Healing’ and Electromagnetic Energy plus Informational Medicine understanding equals 'Ones Reality of Conscious Self-Healthcare'. Sign up now and share with others. "Health is Consciousness and Healing is a Function of Consciousness"
I have come to know that I cannot live life thinking about dangers and fears. I was told around the age of 15 years that my father Charles E. Davis had kidney disease. I thought I am going to have kidney disease. In my generation the baby boomers (1946-1964) I was taught to believe that the things that happen to the body called disease and sickness is hereditary. You see I was told that it was in the genes and you could inherit bad genes from either parent and that the bad gene could skip a generation in the family structure and you could inherit the disease gene from your grandparents. So, I thought I am going to die young. It’s funny that I didn’t have the same understanding about liver disease; you see my mother was diagnosis with that when I was born 1957. However, I never thought that I would get liver disease and die young. My mother was not in and out of the hospital like my father was, I thought I got two kidneys can I give him one. I would be told no. I lived with worry and fear and I prayed that my father would get well be healthy again. I got the news that my father had died at the young age of 37 years old. Now, at the age of 17 years, I am only thinking of how to prevent me from having kidney disease. But how can I do that, when I am constantly being told that the illness is hereditary that I am at risk. I would live with this thought, this belief, and face many challenges health-wise from this belief. It was in my mid-twenties, that I would be introduced to the book “A Course in Miracles." We all grow up with common and different belief systems on health and how to care for the body. We also have a set of family and community values that we live by. Values or principles, standards, or qualities considered worthwhile or desirable, in other words, what we regard as important. They are the basis of our actions, especially when ethical issues are involved. A belief is an idea we accept as true. Unlike thoughts, beliefs come with deeply rooted feelings of certainty. If we really believe something, its effects follow us moment by moment, whether or not we are consciously thinking of it at the time. Beliefs create intense feelings. Criticize a person’s beliefs, and they feel under attack. Once a belief takes root, the mind continually searches for the evidence to prove that it is right, and we behave in accordance with the belief. Although most beliefs are learned in our early years, in adulthood we can consciously and deliberately change a belief that isn’t helpful, including restricting beliefs about ourselves. Beliefs affect us whether they are true or false. Diseases are a part of a belief system and based on the values that we have that is how we deal with diseases, sickness, and illness. Most often we view the situation as hopeless, which also is a part of a belief system of learned hopelessness. Values and beliefs have a huge impact on health, illness and recovery. ​We are creating a safe place for you to have a deep look at your beliefs and your values as it relates to your health concerns. It’s been well documented that we can change our biology simply by what we believe to be true. The placebo effect is defined as the measurable, observable, or felt an improvement in health or behavior not attributable to a medication or invasive treatment that has been administered. It suggests that one can treat various ailments by using the mind to heal. Many studies have shown that the placebo effect (the power of consciousness) is real and highly effective. It is a known fact the western medical system use the placebo effect and 1/3 of all healing is due to the placebo effect. The age of believing is over … we are in the age of Knowing! Health is a Matter of CHOICE. Are you ready to choose it? We are ready with the safe place for you to explore your beliefs and your value systems based on the new science of Conscious Self-Healthcare from Quantum Physics and the Western Medicine on the New Biology. The most important belief you can have is the belief that you create your experience in life as part of your thought and imagination processes. Your most valuable value is the value you place on yourself over all others. Your body is a living organism comprised of living cells and they respond to every action and every thought that you think and translate into words or images. I want to make it clear, that my intention of presenting this information is to demonstrate that thoughts, intentions, prayer and other units of consciousness can directly influence our physical material world. Consciousness can be a big factor in creating change on the planet. Sending thoughts of love, healing intent, prayer, good intention, and more can have a powerful influence on what you are directing those feelings towards. For quite some time now, physicists have been exploring the relationship between human consciousness and its relationship to the structure of matter. Previously it was believed that a Newtonian material universe was the foundation of our physical material reality. This all changed when scientists began to recognize that everything in the universe is made out of energy. Quantum Physicists discovered that physical atoms are made up of vortices of energy that are constantly spinning and vibrating. Matter, at it’s tiniest observable level, is energy, and human consciousness is connected to it, human consciousness can influence its behavior and even re-structure it. I invite you to come aboard our friendship train to health care freedom. You have the right, your God given right to Choose Your Pathway to Health Care. Get the book and make your personal shift from disease care 2 Conscious Self-Healthcare. Complete the form and receive additional detail. Listen to Heart2Heart Healthy Living airs Wednesday 4 pm EST ron www.innerlightradio.com !!!!! 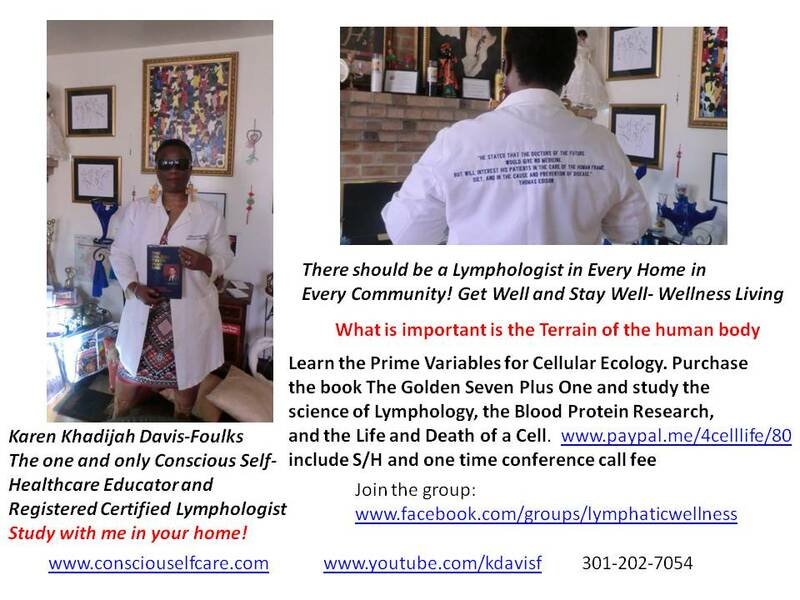 Dr Karen Khadijah Davis-Foulks, Pioneer Conscious Self-Healthcare Educator, Certified NES Health Practitioner, BioEnergetics and BioInformational Wellness Specialist, Lymphologist, non-secular science of medicine. Dr Karen is not a licensed medical doctor or licensed physician she does not work or assist in the field of disease care or diagnosis. There are no diseases just a thought of a disease. Yes, it is time to bury disease thinking. When the physical body receives correct nutrition its cellular environment is conducive for cellular health and regeneration. We are more than over genes and our genes are not just control by chemical biology. Join me on my friendship train we are moving from disease care to conscious self-healthcare. Oxygen + Pumps + electricity = Power Dr. Samuel C. West. 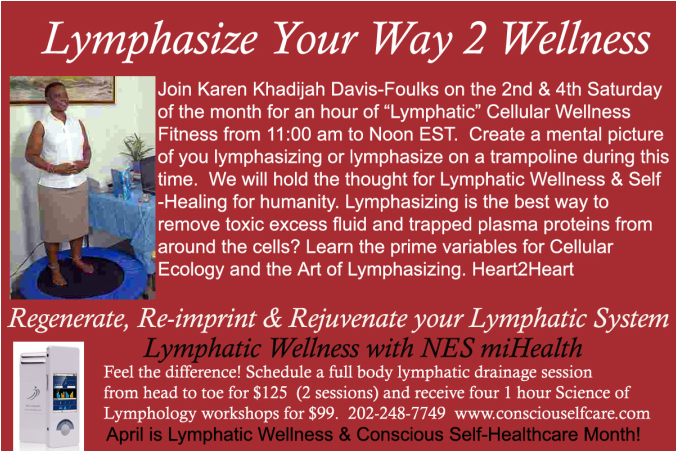 April is Lymphatic Wellness & Conscious Self-Healthcare Month. April 30th is Emancipate Yourself from Medical Mental Slavery Day Click the More link for details. ‬ There is only one disease (the thought of it). There is only one physical condition in the body (mucus) which creates CELLULAR MALFUNCTIONS NOT DISEASE. This is why you are the CURE that YOU are WAITING FOR! Thank You Dr. Sebi for not living in FEAR! I am available for a 15-minute conversation. I will reach out to you, send your request!